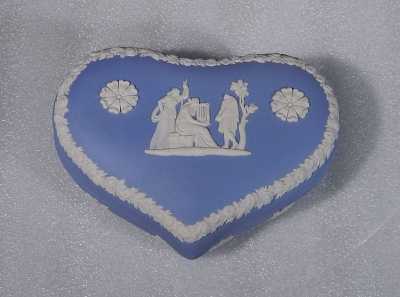 This Wedgwood Jasperware pale blue heart box is actually in very good condition, but there are issues, though none are major. First and foremost is one of the Graces' is missing her head! 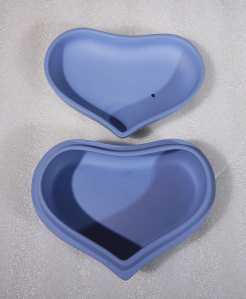 (The one on the left) There is also what appears to be a paint drip on the inside of the lid and another on the bottom of the box. (see photos) There are no other cracks, chips, repairs or damage to note. 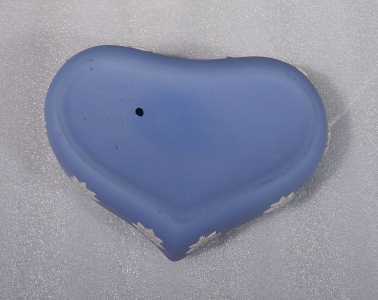 This vintage Wedgwood Jasperware pale blue heart box measures 5-1/4" x 3-5/8" (at the dip & tip) and stands 2-1/8" tall. 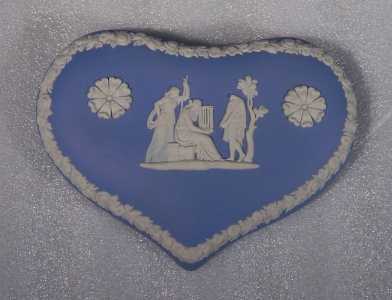 Incised on the base with WEDGWOOD, MADE IN ENGLAND, the number "71" and the initials "MM" and weighs 10.8 ounces. 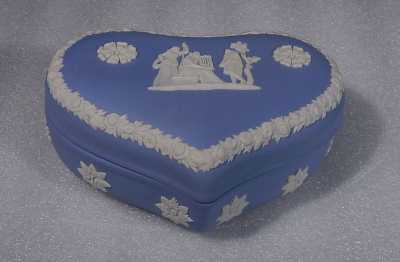 The inside of the lid is incised with the letter "A".